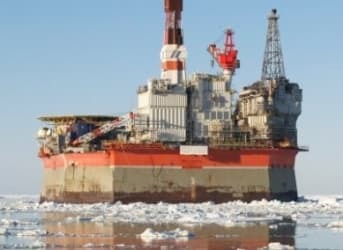 Western sanctions against Moscow have forced ExxonMobil Corp. and Kremlin-owned oil giant Rosneft to suspend drilling at an offshore oil well in the Russian Arctic. Bloomberg News broke the story Sept. 19, quoting individuals familiar with the venture. New U.S. and EU sanctions were imposed on Sept. 12, and activities at the well ground to a halt a few days later, according to three knowledgeable sources who spoke to Bloomberg on the condition of anonymity because they weren’t permitted to discuss the deal between Exxon and Rosneft. The sanctions forbid EU and U.S. companies from helping Russia extract oil from Arctic, shale or offshore fields. They were imposed as a result of Moscow’s annexation of Ukraine’s Crimean peninsula in March and its suspected support of pro-Russian separatists in eastern Ukraine. The U.S. Treasury Department gave U.S. companies until Sept. 26 to stop all such drilling and testing activity. Chris Kettenmann, the chief energy strategist at the New York brokerage Prime Executions Inc., told Bloomberg that Exxon, Rosneft and Seadrill Ltd.’s North Atlantic drilling unit had been under pressure either to finish or to temporarily seal the well by the deadline. The $700 million well, called Universitetskaya-1, is in Russia's Kara Sea, an arm of the Arctic Ocean. Now that Exxon has reportedly stopped all drilling with Rosneft, Kettenman said, work probably won’t resume until sometime in 2015 at the earliest. The Kara Sea has estimated reserves of 9 billion barrels of crude oil worth about $885 billion at today’s prices. Bloomberg says it’s valuable to Russia as a replacement for wells from the Soviet era whose contents are declining, and to Exxon as an opportunity to revive its own diminishing production. The work stoppage at Universitetskaya-1 is the strongest evidence yet that Western sanctions against Russia are having a significant impact. Earlier sanctions banned technology transfers that applied to Arctic, offshore and shale energy deposits, but they contained loopholes -- including one that allowed Exxon to begin drilling in the Kara Sea with an oil rig it had moved there just before the sanctions went into effect. The latest measures closed that loophole by also forbidding the transfer of goods and services to Russian energy companies. Still, U.S. officials told The New York Times that Exxon’s lawyers immediately began looking for ways to sidestep the new sanctions. The sanctions aren’t expected to hurt Exxon’s profits in the immediate future. Exploratory drilling at the Universitetskaya-1 well had only begun when the sanctions went into effect, and significant oil production there wasn’t expected for at least a decade. Yet Exxon’s ties with Moscow could suffer, especially if the sanctions remain in place for the long term. Exxon had looked to Russia as a new frontier for oil reserves to replace those lost in the company’s older, depleted fields. The company also sees Russia as a new customer to replace countries such as Venezuela, which are not as sympathetic to U.S. oil companies as they once were.